Look through the history of motorcycling and it’s obvious that the International jacket was de rigueur riding apparel for the serious rider. Heard of Steve McQueen? 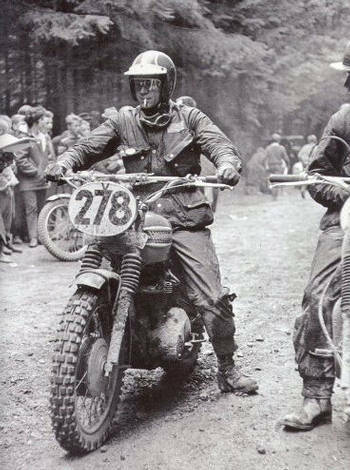 Barbour was worn by virtually every British international motorcycle team from 1936 until 1977, and they were the official motorcycle police jacket in 14 different countries. The Barbour story begins with John Barbour who was born in 1849 and raised on a farm in Galloway in West Scotland, the second son of a family whose links through history can be traced back to the 14th century. At the age of 20 he left the farm to try his luck across the border in the north east of England where in 1870 he started business as a traveling draper. A year later, he married his childhood sweetheart, Margaret Haining who bore him 11 children and gave him the encouragement and belief to start J Barbour & Sons in 1894 in 5 Market Place, South Shields. The shop sold all manner of products loosely described as drapery including outerwear, boiler suits, painter’s jackets through to underwear, and, in the flourishing town of South Shields the shop which became known as ‘Barbour’s,’ thrived successfully. Almost from the first, Barbour derived an important part of its income from the ship-owners, ship builders and seamen of the port, supplying Beacon brand oilskin coats designed to protect the growing community of sailors, fishermen, river, dock and shipyard workers from the worst of the weather. Now over 100 years old, Barbour is a 4th generation family owned company who have developed a unique understanding of clothing that is truly fit for the country lifestyle. Stated simply- Barbour is an authentic British brand providing a wardrobe of clothes for country pursuits, country living and for those who simply love the country, while still maintaining the core values of its heritage, durability, fitness for purpose and attention to detail. A Barbour is more than a jacket, it’s a family heirloom to be passed down from father to son.